He's been called "America's greatest living tailor" and "the most interesting man in the world." Now, for the first time, Holocaust survivor Martin Greenfield tells his incredible life story. 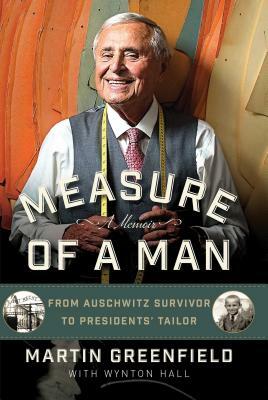 Taken from his Czechoslovakian home at age fifteen and transported to the Nazi concentration camp at Auschwitz with his family, Greenfield came face to face with "Angel of Death" Dr. Joseph Mengele and was divided forever from his parents, sisters, and baby brother. In haunting, powerful prose, Greenfield remembers his desperation and fear as a teenager alone in the death campand how an SS soldier's shirt dramatically altered the course of his life. He learned how to sew; and when he began wearing the shirt under his prisoner uniform, he learned that clothes possess great power and could even help save his life. Measure of a Man is the story of a man who suffered unimaginable horror and emerged with a dream of success. From sweeping floors at a New York clothing factory to founding America’s premier custom suit company, Greenfield built a fashion empire. Now 86 years old and working with his sons, Greenfield has dressed the famous and powerful of D.C. and Hollywood, including Presidents Dwight Eisenhower, Bill Clinton, and Barack Obama, celebrities Paul Newman, Leonardo DiCaprio, and Jimmy Fallon, and the stars of Martin Scorsese's films. Written with soul-baring honesty and, at times, a wry sense of humor, Measure of a Man is a memoir unlike any otherone that will inspire hope and renew faith in the resilience of man. MARTIN GREENFIELD was born in the village of Pavlovo, Czechoslovakia, in 1928. The only member of his family to survive the Holocaust, he made his way to the United States in 1947. He and his sons run Martin Greenfield Clothiers in Brooklyn, New York, the leading American maker of hand-tailored menswear. The tailor to the world's most powerful and influential men, Greenfield lives on Long Island with his wife, Arlene. WYNTON HALL is the owner of Wynton Hall & Co., a celebrity ghostwriting agency responsible for several New York Times bestsellers. The author or collaborator of sixteen books, Hall's published work has appeared in the New York Times, USA Today, San Francisco Chronicle, Daily Beast, Breitbart, Politico, and several others. Hall lives with his wife and daughters in Florida.